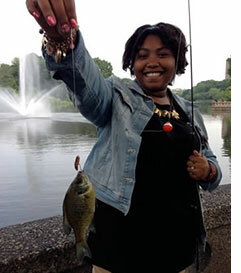 (16/54) TRENTON – The Christie Administration hopes to hook New Jerseyans on a new recreational pastime by offering free fishing as well as a statewide youth fishing challenge on Saturday, June 11, and an additional day of free fishing in the fall. Free Fishing Days and the Hooked On Fishing – Not On Drugs Youth Fishing Challenge have two aims: to introduce families to New Jersey’s excellent freshwater fishing, and to encourage children to avoid drugs, alcohol and tobacco by instead pursuing fun activities such as fishing. Free Fishing Days on June 11 and October 15 will allow anglers to enjoy some of the finest freshwater fishing in the Northeast without having to buy a license or a trout stamp. 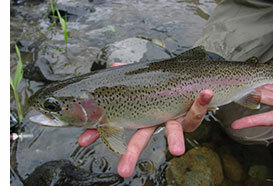 Other regulations, including size and daily catch limits, will remain in effect both days. Free Fishing Day on June 11 also coincides with National Fishing and Boating Week, ending Sunday, June 12. For the Hooked On Fishing – Not On Drugs Youth Fishing Challenge, also scheduled Saturday, participants age 20 and younger may be eligible to receive prizes for the fish they catch (rules and age requirements will vary depending on the challenge location). Participants must be present at the end of the event to claim prizes. Parents and guardians are encouraged to enjoy fishing during the challenge, but are ineligible for prizes. Youth Fishing Challenge events are scheduled at 19 locations in 14 counties across the state. The free event will be held rain or shine, and registration is required. Hooked On Fishing – Not on Drugs is an interdisciplinary, hands-on supplemental program for children in kindergarten through grade 12. It focuses on giving youth a number of opportunities to help them avoid the temptation of using drugs, alcohol and tobacco. New Jersey has hundreds of local ponds and thousands of miles of streams and rivers that offer outstanding opportunities to all for a great day of family fishing. Nearly every local pond provides plenty of action for anglers to hook bass and sunfish. The Division of Fish and Wildlife also offers trophy angling experiences by stocking muskellunge, northern pike, walleye and striped bass hybrids in New Jersey’s larger lakes. Those opportunities are one reason why many are drawn to New Jersey for freshwater fishing. Additionally, the state’s cold, clear streams support a top-rate, year-round trout fishery, and this year’s spring stocking of more than 600,000 rainbow trout will ensure plenty of fish are still available for anglers in many waters statewide. The Division of Fish and Wildlife operates fish culture facilities at the Pequest Trout Hatchery and the Hackettstown State Fish Hatchery in Warren County. For more information on Free Fishing Days, visit: www.njfishandwildlife.com/ffd.htm where visitors will find three online regional brochures to locate lakes and ponds with public fishing access close to home. The brochures contain information on each water body’s acreage, nearest town, site amenities, boat and shoreline fishing, fish available and fishing tips for each species. For information about the Hooked On Fishing – Not On Drugs Youth Fishing Challenge, including event locations, registration information, rules and an event flyer, visit: www.youthfishingchallenge.nj.gov. Each hosting organization/location may have its own rules or “need to know” information, and participants are asked to check directly with the host location.